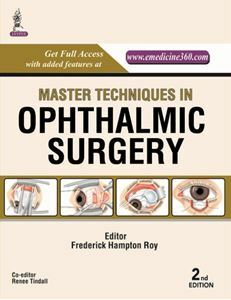 Master Techniques: Ophthalmic Surgery covers all topics related to ophthalmic surgery in 149 chapters. This comprehensive book includes significant sections on various structures of the visual system, covering anterior chamber, choroid, conjunctiva, cornea, globe, iris and ciliary body, lacrimal system, lens, optical nerve, orbit, sclera and vitreous. The most extensive sections of this book concern the extraocular muscles, eyelids and retina, providing detailed information on multidisciplinary aspects. It is an essential reference for all practitioners, providing diagnoses and indications for surgery, surgical techniques, outcomes and references for a variety of ophthalmic conditions.